Hi guys, and welcome to a new Top Ten Tuesday! 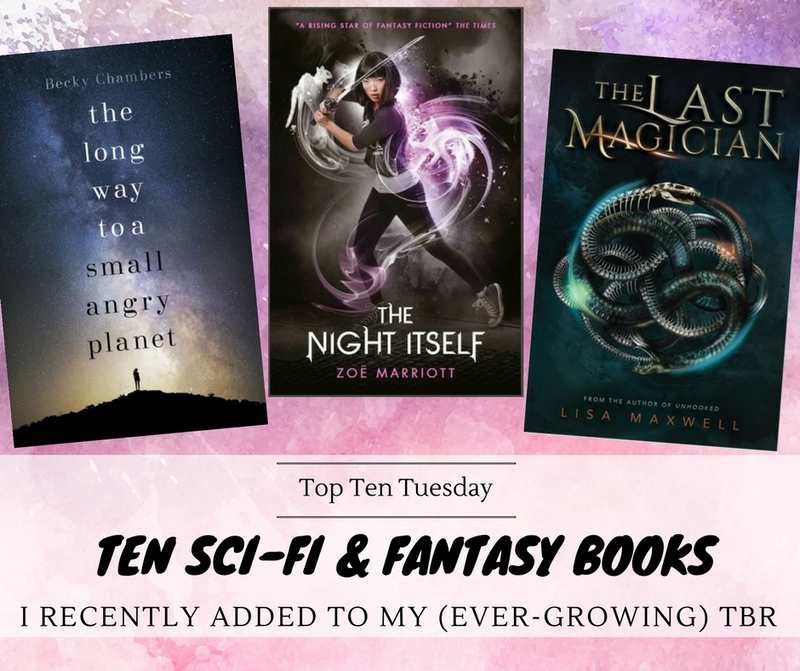 Today I wanted to talk about some of the recent Sci-Fi and Fantasy books that were added to my (always-growing, never decreasing) TBR. Now, I’ve been trying to be more strict with my TBR and not just add any book. A book needs to sound reeaally good before I add it to my TBR. But these books made the cut. They have all very recently been added to my TBR because they sound awesome and got me super excited to read them. So here we go! An urban fantasy with Japanese mythology? I added it to my TBR before you could finish saying the word Kitsune! This sci-fi thriller set in Taipei already has a few rave reviews, so naturally I’m already excited! After (finally) reading the masterpiece that was Illuminae, of course I had to add the sequel Gemina to my TBR at once. 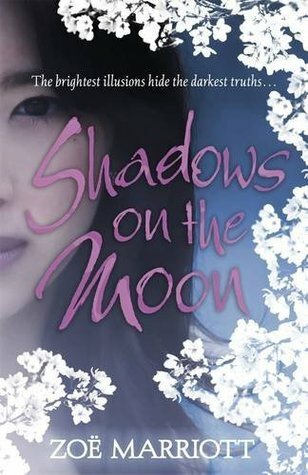 A powerful tale of magic, love and revenge with a strong female lead set in fairy-tale Japan; this is “Cinderella” meets “Memoirs of a Geisha”. COUNT ME IN! A darkly irresistible new fantasy set in the infamous Gomorrah Festival, a traveling carnival of debauchery that caters to the strangest of dreams and desires. Also, did you see that tagline? “Wicked, wicked to the core, the city will burn forevermore.” I am shook and need this now. 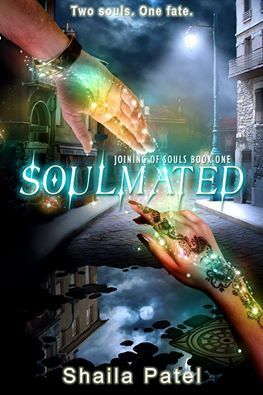 An Irish royal empath, an Indian-American high school student, and the concept of soulmates. Say no more! Magicians in modern-day New York and time-travel. That’s all I need to know to want this. Umm. 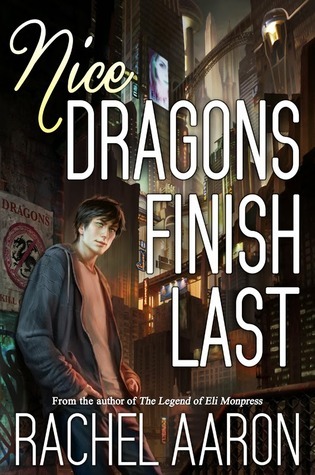 An Urban Fantasy featuring… Dragons? I LOVE DRAGONS! DRAGONS! DRAGONS! DRAGONS! Have you read any of these books? What did you think? Any still on your TBR as well? This reminds me that I still haven’t read Illuminae yet. I really need to get on that. Daughter of the Burning City is one that has caught my eye recently too. This isn’ my genre and hardly read from it but THE LONG WAY TO A SMALL ANGRY, PLANET BY BECKY CHAMBERS is on my Kindle and Gemina is my next read. Great list!! OMG LINDSEY these all look so amazing! I can’t wait to read Want, Gemina (after the amazingness that was Illuminae) and The Long Way To A Small Angry Planet! Thank you so much for sharing and this was such a great compilation! Thanks Anisha! I’m so excited to read these books as well 🙂 Hope we’ll both enjoy them! The Last Magician is really good! I hope you enjoy that one. 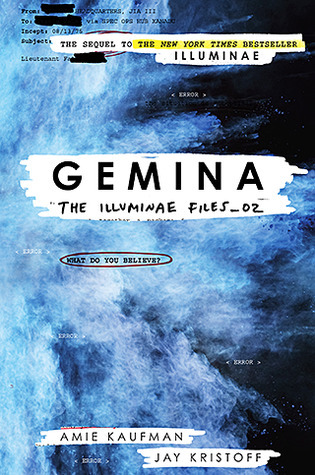 I still need to pick up Gemina after reading Illuminae but I’m so looking forward to it too! Sci-fi isn’t my usual genre but I seem to be reading more and more of them lately. I definitely want to check out Illuminae because everyone seems to have loved it. I have Daughter of the Burning City on my list too. It sounds so good! I have an ARC of The Last Magician, but haven’t gotten around to it yet. I’m really excited about it tho. Great list! That’s so funny, I don’t usually read a ton of sci-fi either, but for some reason I recently added a lot of sci-fi books to my TBR 🙂 I’d definitely recommend Illuminae! In fact, I think Illuminae may have something to do with me trying more sci-fi 😉 Hope we’ll both enjoy Daughter of the Burning City and The Last Magician! Shadows on the Moon and Barefoot on the Wind sound really interesting. I love retellings of fairy tales. I’m going to have to add them to my list! Here is my Top Ten Tuesday! I need to go ahead and read Gemina. I just haven’t gotten around to it. The Last Magician is also on my TBR. I look forward to it. Haha, me too 🙂 But I also don’t want to read it too soon because then the wait for Obsidio may be too long… Choices, choices 😉 Looking forward to The Last Magician as well! I also desperately need to read This Way To A Small Angry Planet. It seems like a must read in the SFS world. I hope we both get to it soon. Exactly! Everybody seems to be loving it, so I NEED to read it and see for myself 🙂 Hope we’ll both enjoy this one! 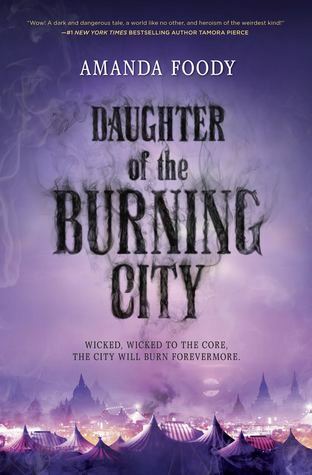 I just got accepted to read Daughter of The Burning City on Netgalley, I’m so excited! Nice Dragons Finish Last and Daughter of the Burning City look FABULOUS. And I can attest that Gemina is so good! I liked it even more than Illuminae. The Long Way yo a Small Angry Planet is awesome too. The Long Way to a Small, Angry Planet sold me as soon as I read “episodic”. How have I never heard of this before?? Hope you enjoy these, Lindsey. Awesome list of Sci-fi books. I haven’t read many sci-fi books but I’m planning to. Illuminae and Gemina are on my TBR list. ? I still haven’t read Illuminae either. I’ve got both books sat on my shelf though all ready for me to get round to at some point! 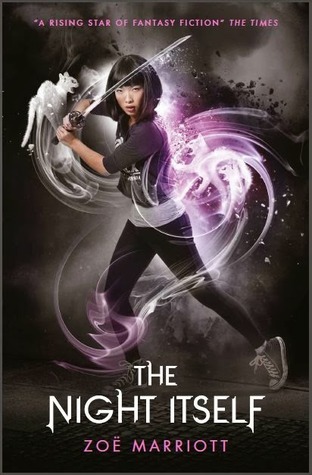 The Last Magician is on my TBR list too, it looks SO GOOD! I can’t wait to get my hands on it! This is such a great round-up! 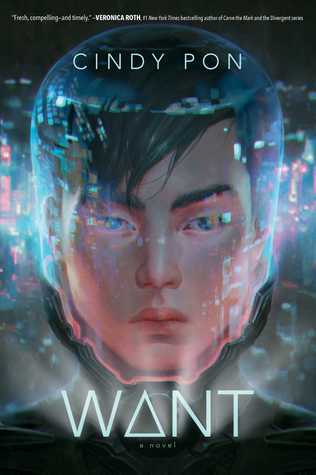 I’m actually reading WANT by Cindy Pon at the moment, and I can’t explain how good it is. The writing flows well, and the dystopian setting both seems unrealistic but also incredibly relatable given the climate conversations happening these days. Hope we’ll both get to The Long Way To A Small and Angry Planet and The Last Magician soon and that they’ll live up to our expectations! There’s some really awesome books here! Some I’ve never seen either! 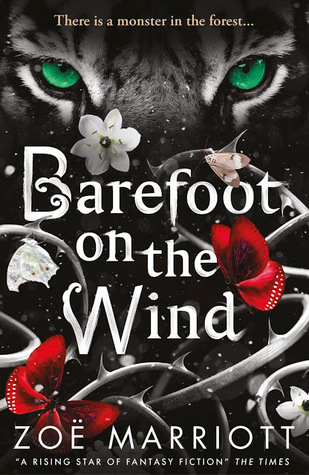 Barefoot on the Wind looks particularly interesting and I think that I’ll have to check that one out! The Last Magician I can’t wait to start – I’m lucky enough to have an ARC of that one. Oh, that’s so cool that you got an ARC for The Last Magician! I hope you’ll enjoy it and I already can’t wait to hear what you think! 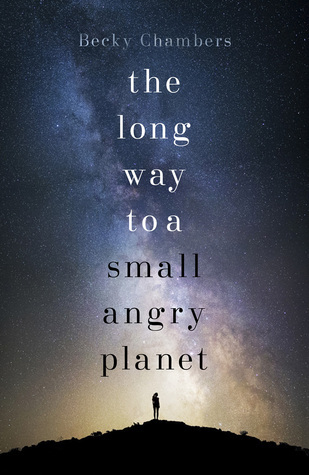 Not the biggest Sci-Fi fan, but I`m excited about “The Long Way To A Small Angry Planet”. I love character driven books and everyone has been raving about this one. 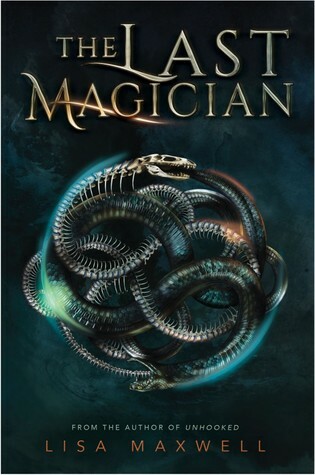 I really can’t wait for my pre order of The Last Magician to come in.